Gen. Douglas MacArthur, commander of Pacific forces in World War II, viewed the Battle of the Bismarck Sea as a disaster for the Japanese and a triumph for the Allies. In that great air-sea confrontation, U.S. and Australian air forces proved that air power could be decisive in preventing the resupply of ground troops by sea. Months of torturous warfare in the jungles of New Guinea had left Japanese troops vulnerable to disease and starvation. In the end, Allied airmen were able to break Japan's grip on New Guinea and end its threat to Australia through the innovative and aggressive use of air power. MacArthur's strength lay in a dedicated and courageous band of airmen who could attack enemy ships from all directions at any time. 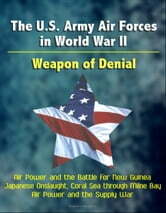 The infamous attack on Pearl Harbor by Japan marked the beginning of a protracted and grueling war in the Pacific. Having dealt a stunning blow to the U.S. Pacific Fleet on December 7, 1941, Japan moved quickly to seize the oil-rich Netherlands East Indies and establish a large defensive perimeter of islands between itself and Hawaii. Seemingly unstoppable at first, it had by late December gained a foothold in the Philippines. During the first three months of 1943, Japanese naval and ground units increased their attacks, consolidated their gains, and moved deeper into the southwest Pacific. New Guinea was their next target. From there, Imperial Forces planned to expand throughout the area, perhaps into Australia itself. By April 1, 1942, they had landed virtually unopposed at various sites from the northwest to Hollandia and down into the southeast. Their arrival spelled the beginning of the long and difficult New Guinea campaign, which lasted until July 1944. Eventually, they were repulsed in their advance toward Port Moresby on the southwest coast of the Papuan peninsula by Allied ground forces and pushed back to the island's east coast. The turning point came in March 1943, when U.S. and Australian airmen won a decisive victory in the Battle of the Bismarck Sea, shattering the enemy's ability to resupply its beleaguered New Guinea garrisons and setting the stage for the ultimate Allied victory that followed. Major William T. James Jr.